The 95-foot Searcher carrying only 14 anglers is a true luxury! Lucky anglers will enjoy private cabins, amazing meals, extra crew support and maximum room at the rail for an action-packed 7-day trip. Treat yourself to an upgrade and turbo-charge your fishing vacation. Target yellowfin tuna, yellowtail, dorado, and wahoo from your spot at the Searcher rail! Check-in: Check-in time is by 10 am (unless otherwise instructed). Report to Fisherman’s Landing Tackle Shop with your passport and cash to cover the departure day extras such as FMM and jackpot. 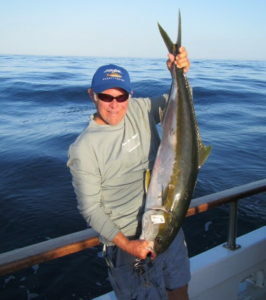 What is included: The trip price includes Mexican fishing permits and all meals including lunch after departure. Canned drinks/bottled water, Mexican FMM, CA license (if needed) and possible fuel surcharge are not included in the price. Full payment is due two weeks prior to departure. Schedule subject to change. Sponsored trips may have an additional passenger.